The contents of this first book and additional books about The Immortal may or may not be true. It is up to the reader to decide. But whatever the opinion rendered, the story and teachings herein are worthy of serious consideration. 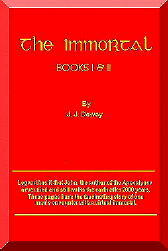 The Immortal - by J.J. Dewey. Is John, the author of the Apocalypse, the Apostle, the Beloved, still walking the earth as a teacher of mysteries? This book about one man's encounter with a Master of Wisdom will "make a believer out of you." If you enjoy reading books like the Celestine Prophecy, Conversations with God, Seth, Alice A. Bailey, Bible mysteries and interpretation, A Course in Miracles (ACIM), metaphysics or esoteric philosophy of any kind, then this is a must-read for you! Chapter 9 Who Are We, Really?